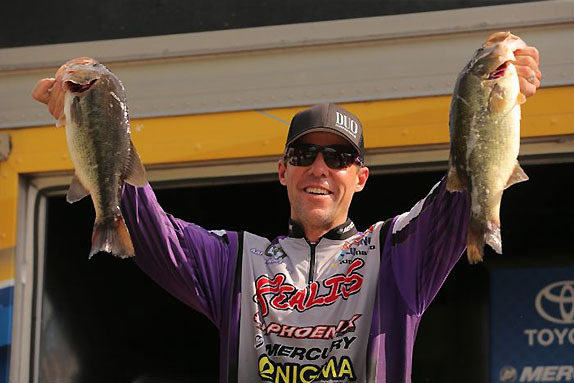 Aaron Martens will carry a 1-ounce lead into the weekend at the Mississippi River. 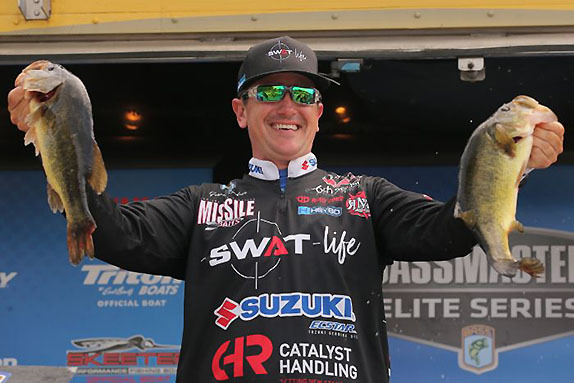 Some new faces entered the top 5 at the midway point of the Mississippi River Bassmaster Elite Series, but with the weights stacked tighter than cord wood, there's an exceptionally small margin for error as the event moves into the weekend. Aaron Martens moved up from 8th place into the lead with a 17-14 stringer today to edge ahead of Randall Tharp with a two-day total of 34-03. 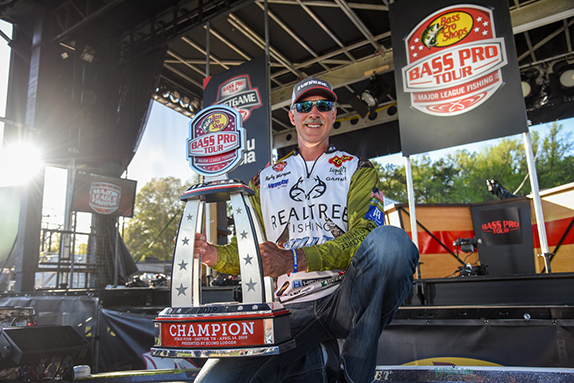 Tharp, who was 7th after day 1, jumped into 2nd behind a 17-12 stringer that gave him 34-02. Gerald Spohrer added 16-06 to his total and has 32-13 in 3rd. Chris Zaldain moved up 32 spots with a 17-11 stringer to slide into 4th with 32-07. Jacob Powroznik held onto his spot in the top 5 with a 15-08 bag that gave him 32-06. Day-1 leader Chad Pipkens scraped together 12-06 with a spinning rod and heads into day 3 in 11th place with 30-05. Surging up the leaderboard from 83rd place into 18th was Ott DeFoe, the 2016 winner at La Crosse, with a tournament-best 18-12. If he�s figured them out, and has the quality and quantity to last, he could very well be fishing on Sunday. Also making a big move to make the cut was Kevin VanDam, the current top-ranked angler in the BassFan World Rankings. He caught 15-11 and jumped 35 spots to 31st with 28-10. After a strong day 1, Darrell Ocamica slipped out of the cut today with a 9-08 limit. He fell from 11th to 66th with 25-10. 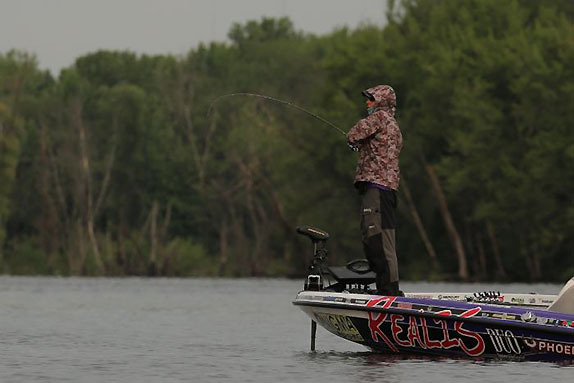 Mark Daniels Jr. endured a rough day with 6-12 for three fish, dropping him from 18th to 88th. Boyd Duckett also struggled following a solid start. He logged one 3-02 keeper and fell from 19th to 98th. Many variables, like weather, water levels and clarity, are well beyond anyone's control, but one factor that seems to be on most anglers' minds heading into the weekend is fish management. While Saturday's forecast looks to be warm with light northwest winds, Sunday�s forecast of thundershowers just after the event concludes could inspire a feeding frenzy for the final day. Martens has relied on areas that he's fished in past Elite Series events at La Crosse. Martens could very well be on the spots that might win this tournament, but he�s afraid that because he�s sharing the spots with Zaldain that he�ll eventually have to rely on his Plan B area. He has no shortage of spots, but none yield the quality that he has been catching so far. He's familiar with two of the areas, as he�s fished them in past Elite Series events, but he was surprised to discover that he and Zaldain think alike. �I graphed the whole lake and the spot I�m fishing, there is nothing there but fish,� Martens said. Admittedly, he�s finding it hard to break the 3 1/2-ound mark after sifting through 25 fish. He stopped fishing at 8:15 a.m. and went graphing in hopes to find a special spot. He burned five gallons of gas just idling today. He�s yet to test his back-up plan since he hasn�t needed to just yet. That spot would afford him a mixed bag unlike the schools of largemouth that he has been fishing. He�s confident that other anglers haven�t found them but finding the right quality could be his greatest obstacle. Randall Tharp is employing a technique that's been productive for him in the past. Tharp�s success, so far, has come as a bit of a surprise to him. Despite having a successful practice that included several big bites, he never anticipated his areas being as good as they are. He was done fishing by 10 a.m. and went practicing for day 3. With water levels rising a foot per day, he�s never fished raging current like this. To counter that, he's fishing a confidence technique, keeping his flipping stick in his hand all day. Using a big weight, he�s fishing isolated targets that are holding both smallmouth and largemouth bass. It's the same way he fished en route to a 17th-place finish at La Crosse in 2016. Though his spots aren�t stacked up, he knows what the fish are holding on. �The more flow we get, the better it places big fish where I can get a bait to them,� he said. His biggest concern is the rising water levels. He�s camping beside a marsh and wouldn�t be surprised to wake up Saturday and it be gone. He�s heard that by early next week, water levels could reach 12 1/2 feet from their regular 7-foot depth. If his current deal falls apart, he�s tested his back-up plan and he is just as confident in it. He�s seen other anglers who made the cut around him but no one is fishing the way he is. 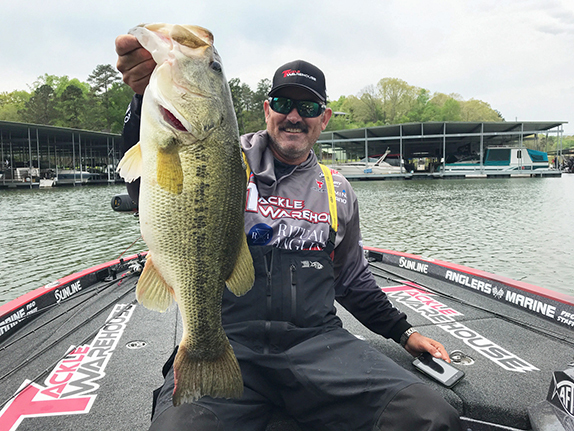 Despite losing one in the 5-pound range, his bag was anchored by a 4-09 kicker and he also had a 4-02. Spohrer is fishing a frog and he�s not even worried about anyone knowing. His main numbers spot from yesterday wasn�t as good today. �That spot has clear water and grass and those fish don�t respond well to bluebird high skies,� he said. Instead, he leaned on his big-fish area a little more today. That said, he�s confident no other angler has any clue where that area is and that he will have it to himself with the hope that it will continue to yield upgrades for him. He thinks if he can maintain a 16-pounds-per-day pace, he could be in the mix for the win come Sunday. He�s also located a school of bass around a specific tree that has given up a fish on his first flip with a Missile Baits D-Bomb each day he's gone to it. Gerald Spohrer is hoping to maintain the pace he's set through two days. The boats near him fishing offshore are on bass that Spohrer knew were there, but as he predicted they have funneled right into where he�s fishing once they broke apart. The offshore spot was stellar in practice and his areas were not, but he knew the tables would turn, which is why he banked on his two areas instead. The only sure thing for Powroznik tomorrow is that he�s just going fishing. Since the conditions are changing so quickly every day, keeping an open mind will be critical to how he finishes the tournament. 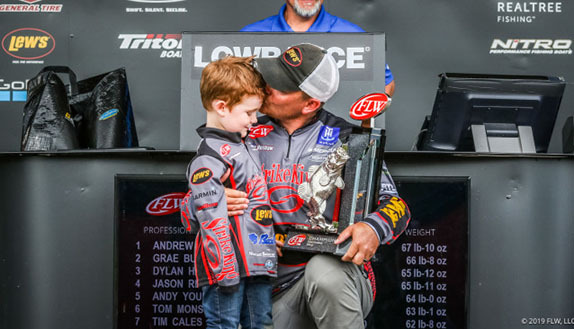 Those watching Bassmaster Live late in the morning were privvy to a flurry of action as Powroznik picked off aggressive largemouth while fishing a frog. He admitted to missing 10 bites in the afternoon after letting his adrenaline get the best of him. He�s not too concerned if he gets more water or current running through the area so long as the water stays clean. Execution will be the most important element. �I think that area, which is 3 miles by 3 miles, has a lot of quality fish,� he said. He�s found his limit fish are out front of the area he�s fishing and easier to catch than the quality fish that have buried themselves in the back of the area that few anglers would try to get to. 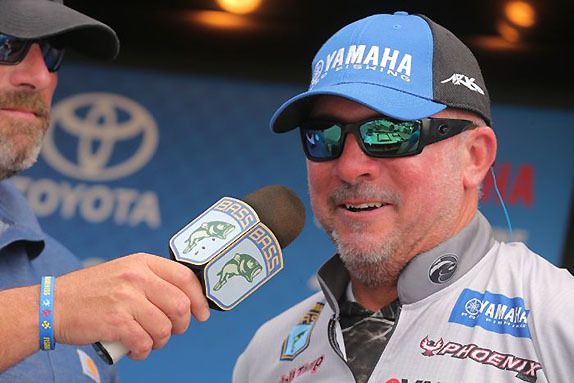 Ish Monroe is one of the best frog anglers in the sport and there�s no bait he�d rather be throwing, especially when he�s caught 50 largemouth a day for the first two days of competition. He was happy and surprised with his weight today. �I felt like I could have an opportunity at 15 (pounds) a day," he said. "I just had a little bit of a better day by adding some 3 1/2- and 3 3/4-pound fish." Should Monroe eventually win the event, he�s got quite a story to tell the crowd. �I missed my turn to the spot that I was going to start at and got right up on a sand bar," he recalled. "I pushed my boat up off and was so tired I just put my trolling motor down and took a break. I looked up and saw an area like what I�ve been fishing and caught a limit in 10 minutes." The spot he fished on day 1 was 1 1/2 iles from the spot on the sand bar so he just fished his way there, which took him until 1 p.m. because he was catching so many fish. Upon arriving at his spot today that he�d found in pre-fish, they�d moved 50 yards, but once he located them, the flurry continued. �They have highways for these fish to come in and with these current conditions, they are filtering to these areas,� he said. He�s cautiously optimistic and vows that he's �just going fishing and not putting too much on it. For some reason, when I do that I fish better,� he added. Adrian Avena shook his head in disbelief after finishing in the triple digits for the first time in his career. He�d fished the Mississippi River the last time the Elites visited in 2016 and he fished it last summer as his girlfriend only lives a half-hour from the river. Looking back, running to Pool 9 on Thursday and coming back with two fish sealed his fate. Today�s 13-09 bag wasn't enough to overcome the hole he'd dug. Despite the disappointing finish, he�d already started to take stock on where things went wrong. > Day 2 stats � 107 anglers, 95 limits (3 fewer than day 1), 2 fours, 6 threes, 1 two, 2 ones, 1 zero (same as day 1).